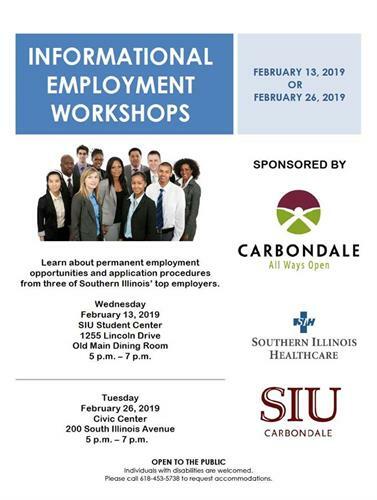 Learn about permanent employment opportunities and application procedures from three of Southern Illinois' top employers (SIH, SIU and the City of Carbondale) on Tuesday, February 26 from 5-7 p.m. at the Carbondale Civic Center. This event is open to the public. Individuals with disabilities are welcomed to attend. To request accommodations, call (618) 453-5738.